Not lost as in unknown or misplaced, just islands that we couldn’t squeeze into the Caribbean feature in Sunday Times travel. Which was a shame, because I really like PR. It has elements of Cuba (particularly the great music out in the hinterland) but, being a US territory, the plumbing works and so does the catering. 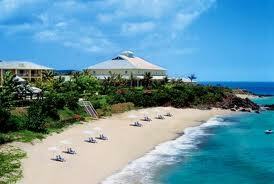 The picture below is the beach at W Vieques. BEST FOR: adventurous travellers and adventurous families, too, thanks to US-style resort hotels with large rooms. It is a very mixed island, from the raucous bar scene in San Juan, to the more elegant, cultured Ponce, the El Yunque rainforest, the ruta panoramica, a twisting mountain roads through coffee plantations and lots of really excellent beaches. One drawback: no direct flights now BA has pulled out. STAY AT: the Caribe Hilton opened in 1949 and remains one of the best seaside choices in San Juan; British Airways (0844-493 0758, ba.com) has it from £1,099 with flights via Miami, room only. Style-hounds should head for the little island of Vieques, once US Navy Property, which now has a swanky W Hotel. ITC Classics (01244 355 527; itcclassics.co.uk) three three nights at the new-ish super-luxe St Regis on the mainland and four nights at W Vieques from £2,345pp, room-only. A fly-drive is a good option – Western & Oriental (020 7666 1234, wandotravel.co.uk) has three nights in San Juan, two at the beach in Rincon and two in historical Ponce, from £1,439pp, room-only, with car hire. DRINK /EAT AT: Head for Old San Juan, a UNESCO protected enclave, with lovely, shabby pastel-coloured buildings with plenty of bodegas (such as Bodega Chic on Calle Cristo) and tiny hole-in-the wall chinchorros to try the local Barrilito rum. In brasher Condado, a mini-Miami, Oceana (001 787 728 8119, oceanapuertorico.com) has a beachside patio and an easy-on-the-eye crowd. No contest for the essential PR dining experience: La Ruta del Lechón or the Pork Highway. About 40 minutes drive from San Juan, it is a road (Route 184) lined with lechonaras, pork shacks, selling slow-roasted suckling pig as well as blood sausages and rice dishes; many open Thurs-Sun only and some have live music. Most are around the village of Guavate: just pick the one you fancy. Expect to spend less than a tenner for a blow-out. For something more sophisticated try Marmalade Restaurant & Wine Bar (001 787-724-3969; marmaladepr.com) in San Juan, with complex but successful dishes by an ex-Le Manoir Aux Quat Saisons and Le Cirque chef (four-course tasting menu, £38). BEST BEACH: for families, the clear waters, brilliant white sands and facilities at Luquillo, about 30 miles east of San Juan. The deep horseshoe of Flamenco beach, with its mirror-flat sea, on Culebra island is quite simply world-class. DIVERSIONS: Puerto Rico has astonishing areas of bioluminescence, where the microorganisms make the sea glow, shine and sparkle. Swimming, though, is prohibited. Kayaking Puerto Rico (001 787 43235 1665, kayakingpuertorico) has two-hour trips to paddle among it from Fajardo from £29pp. The best bioluminescence involves a trip to Vieques, however: try Abe’s Snorkelling (001 787 741 2134, absesnorkelling.com), which has kayaking trips from 32pp. This entry was posted in Uncategorized and tagged Caribbean, islands, Puerto Rico, Travel on August 25, 2013 by Robert Ryan.